Home/Trending Now/Pak/GB ORDER 2018 – A FATWA! Pakistan has bifurcated occupied Kashmir into two administrative parts; Gilgit-Baltistan (GB) and Pakistan-occupied Kashmir (PoK). Until GB Order 2018, GB was treated as a separate geographical entity by Pakistan. But China’s controversial $50 bn China-Pakistan Economic Corridor (CPEC) which passes through this disputed region prompted Pakistan to change its status. GB erstwhile known as Northern areas comprise of Gilgit Agency, Baltistan district of Ladakh Wazahat, hill area of Hunza & Nagar. In 2007, Northern Areas were renamed to GB. At the time of partition, the population of this area was 80% Shias and 20% Sunnis. However, demographic engineering steered by Pakistan has increased Sunni presence in the said area. In 2009, Gen Musharaff as the President brought in GB Empowerment & Self govt Order for administering these 10 districts through a Unicameral Legislative with elected CM and 12 Provincial Council members(6 elected & 6 nominated). 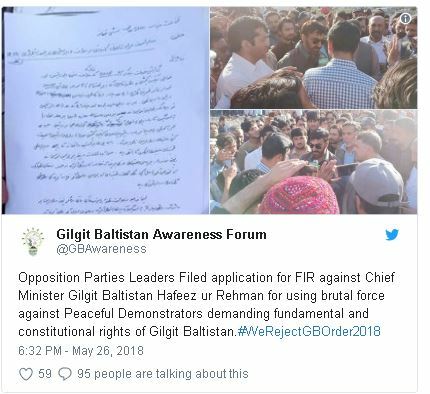 Gilgit-Baltistan Order 2018 replaces the GB Empowerment and Self-Governance Order of 2009. The new order changes the nomenclature of Gilgit-Baltistan Legislative Assembly to Gilgit-Baltistan Assembly. Under the 2009 order, the legislation on the federal laws was adopted on the recommendations of a council that had the representation of six members elected by the GB Legislative Assembly along with an equal number of members nominated by the prime minister. The GB’s chief minister and governor were also members of this council. In 2018 all these powers have been entrusted to the federal government, thus eliminating even a semblance of an elected body. This will restore the old bureaucratic structure, with the prime minister and bureaucrats, who are not accountable to the people, controlling the affairs of GB. 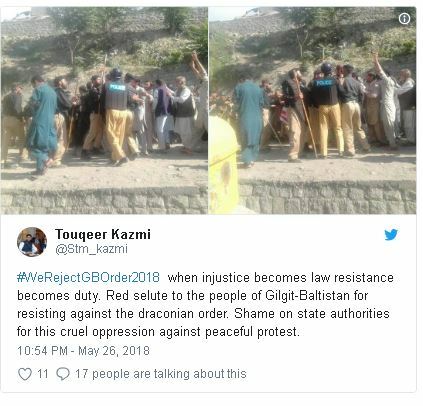 Thus GB Order 2018 vests all the powers of the legislature, administration with the Prime Minister of Pakistan and it makes the judicial system of the GB subservient to the PM. As per Dawn, all powers exercised by the four provincial assemblies under Schedule IV of the Constitution of Pakistan have been entrusted to the GB Assembly. The assembly shall have the right to pass legislation regarding mineral, hydropower and tourism sectors. These powers were previously exercised by GB council, and concern the most vital sectors of GB economy. Whatever little freedom of governance the elected council had, has now been usurped through this GB order – ‘Kabza’(It is no less than a ‘Kabza’ by Pakistan). The more tangible form of the Kabza comes in the form of structural violence manifested through check-posts, seizures of prime property and lands by institutions, lack of political representation and so on and so forth. Whereas, the intangible form of the Qabza can be conceptualized as the hegemony of the state. Well, the readers should know that the Constitution of Pakistan confers no powers of legislation on PM, but the PM will make the laws for GB assuming ultra-constitutional status. A provincial type of government will be constituted, comprising of the elected representatives of the GB with symbolic powers. The Chief Minister and his cabinet members will be chosen representatives of GB. Keeping in view the above facts, if one goes through the preamble of the order, as has been reproduced above, it seems mockery with the oppressed people of GB and nothing but a disguise. The other provinces have their respective assemblies. The assemblies are having full power to make laws in respect of the province. The provinces have their own independent high courts, the PM of Pakistan has no job to appoint the judges of high courts and he has no concern with the remuneration and other terms of services of the judges of high courts. In Gilgit-Baltistan, the interests of the establishment (Milbus, Bureaucrats, feudalists, Political Mafia and the Capitalists) converge. They desire financial/economic gains and are acting in concert like a gang of thugs. The area is rich in minerals and its hydropower potential is estimated to be 40,000 MW, which remains unutilized much to the chagrin of the people. It is almost a virgin economy with tremendous potential for growth. Currently, it is dependent upon Gilgit-Baltistan almost as the body is dependent on the face, as a means for in-taking its supply of survival (Chinese trade and river Indus) and to present itself through an attractive image (Ecological Body). Along with, the function of the Ecological body, GB also serves to complete the ‘Cultural’ body of Pakistan. It is the ecology and the culture which are used to present the ‘exotic’ image. The people of Gilgit-Baltistan know that they had been completely ignored for decades in schemes of development, that their land is vital for the country and that they have been exploited invariably, but still continue to work for and support Pakistan, shows the power of the Qabza on the mind. Political Marginalization of GB to secure maximum benefits from CPEC without giving due share to the people of Gilgit-Baltistan. Ability to seize and buy valuable land in Gilgit-Baltistan for housing schemes, tourism ventures, and mineral resources. Create Civil Service and other government service positions for Pakistani Bureaucrats to fill. Secure the ability to suppress legal cases against exploitation through the installation of top-tier judges from outside of GB. Eliminate agents of resistance through legally approved abductions by law-enforcement agencies. The intellectuals in GB need to stand united with the people of GB and reject the “Fatwa” (GB Order 2018) of deceit and falsehood. A connect with people on the ground for a united resistance is what is required to rightfully demand their control over their own land. The people of Gilgit-Baltistan deserve nothing less than to enjoy the same rights as other citizens of Pakistan.